How many pieces of iwatch cases will I get? Answer : You get 5 pieces of iwatch cases 38mm, 1x Black, 1x Red, 1x Midnight Blue, 1x Pink, 1x Brown. Are you worried about choosing wrong size case for your Apple Watch? 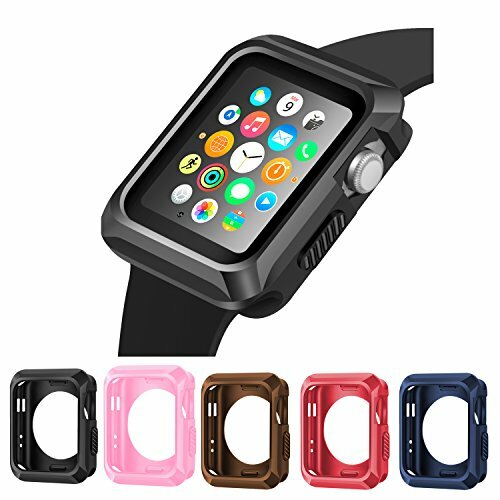 Answer : This Apple Watch Case is your perfect choice because it is designed for both Apple Watch 38mm Series 1 and Series 2 and Series 3.Please don't hesitate to buy it. Are you worried that it is easy to fall off? Answer : This Apple Watch Case wraps your apple watch tightly. It will never fall off. Is this Apple Watch Protective Case easy to be dirty? Answer : The black and Midnight Blue are hard to be dirty after long time usage. While the pink is easy to be visible dirty because of light color. But it is washable. Is the band come with the Apple Watch Case? Answer : No. You will only get the protective case. If you want, you can choose bands replacement from our store. Warranty: One year warranty, life-time friendly customer service. Your satisfaction is our Pursue. Any problems, please contact us before you leave a bad review or feedback. Question 1 : How can I get faster customer service? Answer: Two ways to contact us. 1. On this page, click on "iitee" next to "Sold by", then click on "Ask a question"on the right top of page. 2. Log in your amazon account > choose "Your orders" > find the order ID > click "Contact seller"
If you have any questions about this product by iiteeology, contact us by completing and submitting the form below. If you are looking for a specif part number, please include it with your message.